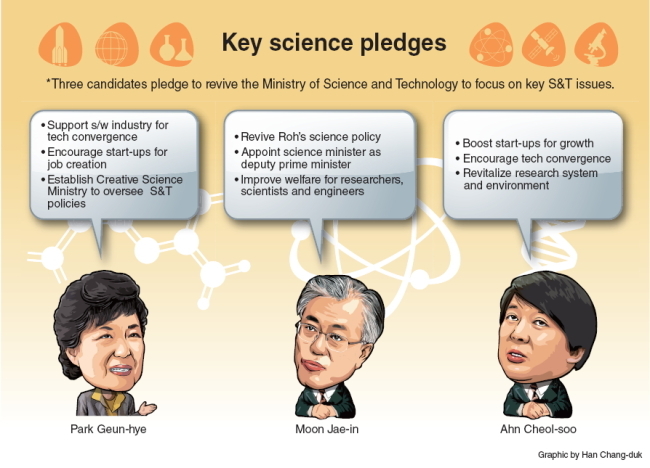 The three major presidential candidates may differ on key policies but all believe that Korea’s future depends on science and technology for growth. Their policies in the field converge in many aspects, including plans to revive the ministry for science and technology, as well as increasing support for research and innovation. The Saenuri Party’s Park Geun-hye has the most extensive agenda. An engineering graduate, she prioritizes developing the software industry, supporting start-ups and establishing the Creative Science Ministry. “We must lead Korea’s mid- to long-term growth based on knowledge (of science and technology),” she said on Oct. 17 when announcing the camp’s science and technology policy in Yeouido. The Democratic United Party’s Moon Jae-in, a former human rights lawyer, suggested reviving the late President Roh Moo-hyun’s science policy with the potential science minister also holding the title of deputy prime minister. Roh had set up a science innovation unit under the wing of the science ministry. “Without science and technology development, there would also be no job creation,” Moon told the science community last month. Independent candidate Ahn Cheol-soo, a former software entrepreneur with a degree in medicine, also gave emphasis to start-ups and technology innovation for growth. “It is important that we develop a policy, system, environment and culture in which scientists can feel the challenge (to create),” Ahn said during a visit to a robotics lab in September. Until the presidential race, science was not given much serious thought as it was overshadowed by education. During the Lee Myung-bak administration, education and science have both come under the Ministry of Education, Science and Technology. Education was given more attention as it involved sensitive issues such as private education, after-school curricula and overseas studies that concerned the public more than science despite efforts to find synergy between the two. The initial intention of putting those two together was to promote science and next-generation scientists especially in the study and research of fundamental science such as physics and chemistry through education. However, this did not turn out as the incumbent administration wanted. “While science should be focused on future-oriented goals, education is a key election issue in which the government is under pressure to fix things in the short term,” said Oh Cheol-ho, professor of Soongsil University’s School of Public Administration. Rather than create synergy, science and education instead clashed against each other. “They cannot go hand in hand,” said Lee Kong-rae, professor of Daegu Gyeongbuk Institute of Science and Technology. The other reason for merging education and science into a single executive branch was to streamline bureaucracy in line with the Lee administration’s restructuring for efficiency. For instance, the incumbent administration dismantled the Ministry of Information and Communication by merging its telecommunication policymaking unit with the Korea Communications Commission. It also handed over its key IT and research and development policymaking to the Ministry of Knowledge Economy. Industry sources said these dispersal functions have made it difficult for Korea to maintain its focus and strength. With lagging key science ministerial operations, which experienced a similar fate as ICT, the research environment did not fare well, driving many scientists and engineers away from home. Even though Korea’s R&D capability and investment have almost reached the levels of other developed economies, instability remains in the science job market. Experts say all these negative factors led to an increase in the number of people with a master’s degree in science and engineering leaving the country to seek opportunity abroad over the years. Empirical data by the U.S. Science and Engineering Statistics and Korea’s Science and Technology Policy Institute show that the number increased to 12,240 in 2011 from 12,174 in 2010 and 11,240 in 2009. The Ministry of Education, Science and Technology stated that the increase in outgoing potential researchers is small compared with incoming ones that reached some 6,000 in 2011, up from 4,900 in 2010. 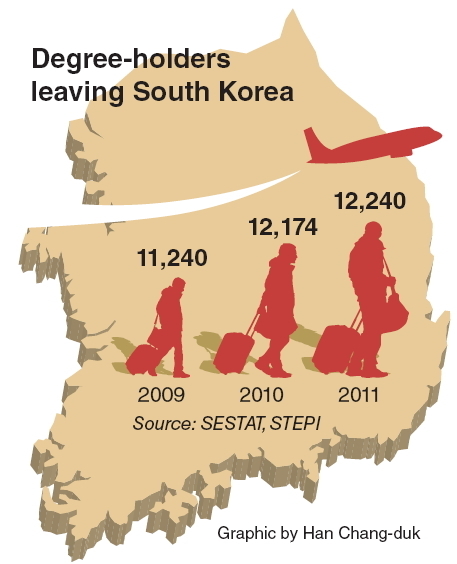 Nonetheless, people leaving the country exceed those coming in. “Morale among scientists has dropped, I have heard,” Moon said, citing data that showed more than 70 percent of those surveyed indicating that they would like to go overseas should the opportunity present itself. Independent Ahn said that country needs to revitalize its system of research and social perception, while conservative Park emphasized the need to create a creative environment for technology convergence. Science is the study of discovery and invention that also pertains closely to building venture start-ups, said Oh. This takes a long period of time and is done through trial and error. Failure is common, but is not usually accepted in Korea, where every result has to be produced fast and without error. For this reason, most people focus on applied science, where it is possible to show results in two to three years based on other existing scientific theories and technology, experts said. Opportunity is rarely provided to those who previously failed in start-ups or research in Korea as they are seen as some sort of “public enemy,” while the success of Silicon Valley in the U.S. has relied on giving chances to the 99 percent of entrepreneurs who failed before. Shinya Yamanaka, the winner of Nobel Prize for his research on induced pluripotent stem cells, said in a recent interview that success can only be achieved through lots of failure over a long period. Whoever wins the seat at Cheong Wa Dae, the next government should put its Science Ministry to the fore to enable changes and create a new paradigm, said Oh of Soongsil University. “The next new ministry should play the role of an ‘enabler’ that can help establish a new environment and ecosystem where the public views science and scientific research differently,” he added.